While the third-party support on the Wii U is without question anemic, besides Nintendo providing content itself, indie developers have picked up the slack. In a certain sense, it's somewhat of a blessing that the larger third-party studios have decided to stay away from the Wii U. Indie developers and their games don't get as easily overlooked or upstaged due to the fact that there's little else on the system besides what Nintendo and competing indies have to offer. I know for certain that I probably wouldn't have been able to take a look at so many indie games on the Wii U had my time and money went towards larger, more expensive third-party efforts. That isn't to say I don't miss third-party support or the absence of it is great for the Wii U or the indies developing for it. Still, I love highlighting indie developers when I can, and when one of the studios churns out a game, I'm happy to cover it-- more so if it's of actual quality. 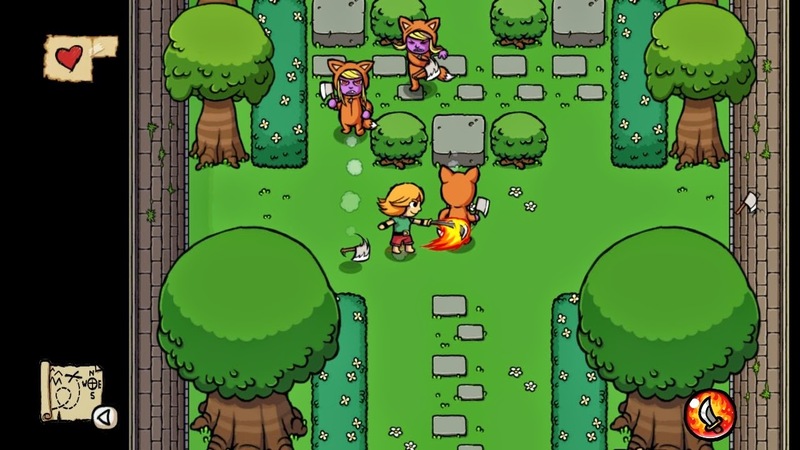 Ludosity's Ittle Dew, a Zelda-like game that released on other platforms in digital form last year, is one of those games. Take a gander at what Ittle Dew does right, and you'll see that you'll want to do the dew, too. One thing you'll notice right away when playing Ittle Dew is its great similarities to The Legend of Zelda games A Link to the Past gameplay-wise, and The Wind Waker, art style-wise. 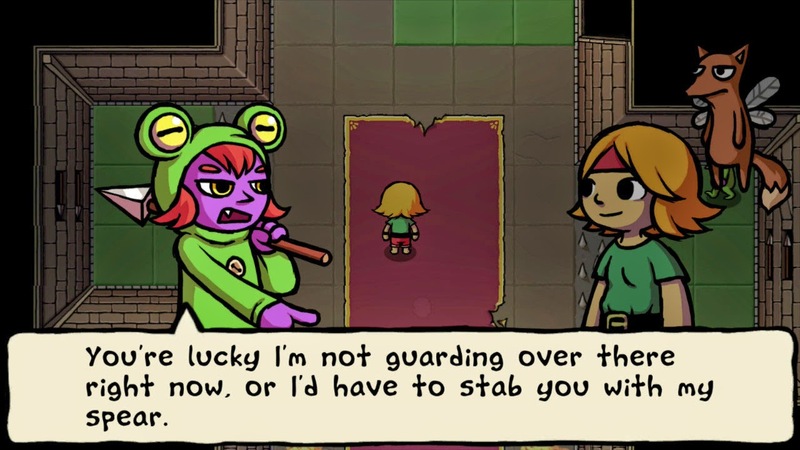 Ittle Dew constantly plays out like an amusing parody of the series that doesn't take itself seriously in the slightest. 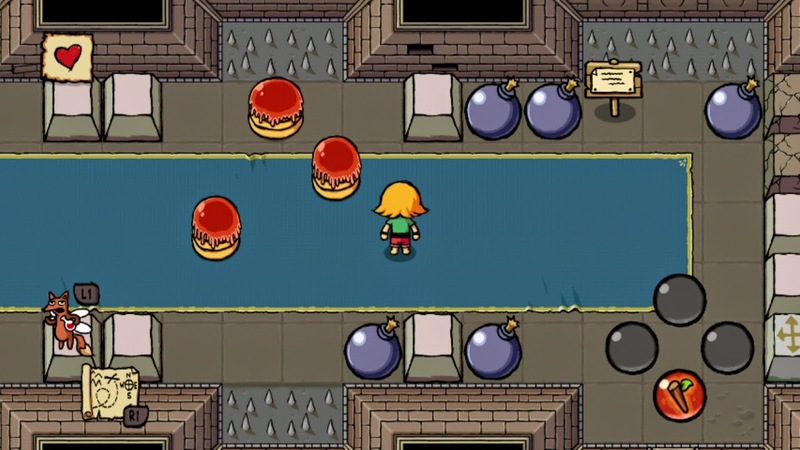 From making morbid jokes about eating the hearts of enemies to regain health to why the island exists in the first place, Ittle Dew puts a lampshade on many Zelda conventions, but it does so in all good fun. I think we can all be thankful that isn't the case! Ittle Dew has you returning to the island's main castle on multiple occasions. It's pretty much the game's Temple of the Ocean King a la The Legend of Zelda: Phantom Hourglass. However, unlike said temple, progress through the castle is made easy with various portals that can be traveled through to make reaching past destinations inside the huge area a breeze. The purpose of trekking through the castle is to obtain gold from treasure chests. Once enough gold has been acquired through venturing within the areas available to you with your current set of items, you can return to the island's shopkeeper to purchase a new item. Well, that's not entirely true. You see, simply purchasing the item you need wouldn't be much of an adventure! Instead, you get transported to the dungeon where the desired item is located. Not only do you have to find your way to the chest containing the item, but you have to get out of the dungeon using the newly attained doodad. "Is that swordfish fair game to purchase?" There are three main items within Ittle Dew, and they each take up a face button on the Wii U GamePad. The portal wand takes up two spaces: one to summon a green block, and one to shoot a wave of magic that will teleport whatever or whomever it touches to the location of the summoned green block. The latter two items include the fire sword, which is great for lighting up torches, and the ice wand, great for freezing foes. The combination of items allows you to reach further inside the island's castle, eventually letting you face off against the game's final boss. overhead fire sprinklers in this castle! 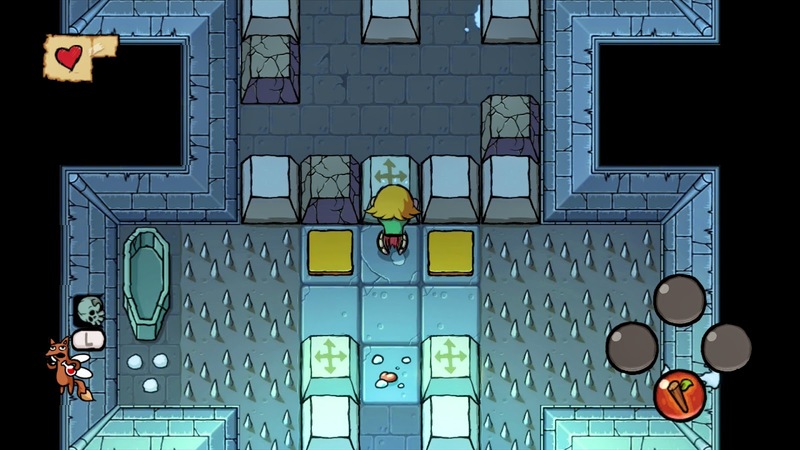 The majority of puzzles in Ittle Dew revolve around manipulating blocks, defeating all of the enemies in a room, and using the trio of items in the game either separately or in combination with one another. Such a puzzle can have you summoning a green block with the portal wand, freezing the block with the ice wand so when you push the block it slides across the ground (notably over the otherwise impassable spikes) until it hits something solid, and then you using the ice wand on a wall so when you fire the portal wand's magical beam at it, it reflects off the frozen part of the wall, hits you, and you transport to where the frozen block rests. This effectively allows you past the spikes that were halting your progress. No worries-- it's a much easier process to see than it is to write out! Ittle Dew seems like a short game for those who simply plow through it. However, there's a wide amount of collectible cards which feature information about various enemies in the game, as well as bits of scrap paper that when four are collected, an extra heart is added to your total health. The latter sort of sounds familiar, does it not? The inclusion of various optional caverns and puzzles make for a game that can be played long after the credits have rolled. For those who have waited for the Wii U version or simply had no other alternative, there's really nothing special that distinguishes this Wii U iteration of Ittle Dew over already released versions. For one, the GamePad's sole use is as a map for players. Now, that's helpful and all, but it's not like Ittle Dew is an open world game where the player needs to constantly look at a map to see where he or she is going. Secondly, off-TV play is supported, but in a baffling omission, there's no sound from the GamePad when this option is selected. Hopefully this can be patched in in the future, and it won' take long like a certain game called Giana Sisters: Twisted Dreams, which, by the way, we've still yet to see a patch for for the same problem here in North America! The visuals of Ittle Dew are really lovely and beautifully done. Characters and objects have lines that sort of wiggle and vibrate as if they were in a Dr. Katz cartoon, but it's an endearing artistic touch. The game runs relatively well, but the constant auto-saving and loading in between rooms or areas makes for some noticeable slowdown. Regarding Ittle Dew's sound, the music is passable, but I wouldn't be able to hum you anything from the game. That's just how forgettable it is, albeit thankfully not grating. Ittle Dew is an inexpensive ($10 USD) take on The Legend of Zelda formula that isn't afraid of poking of itself and series conventions. What might at first seem to be a short and rote take on the series's gameplay is actually something worth playing due to some clever, usually brain-scratchingly good puzzles, humorous writing, and large list of collectible goodness. 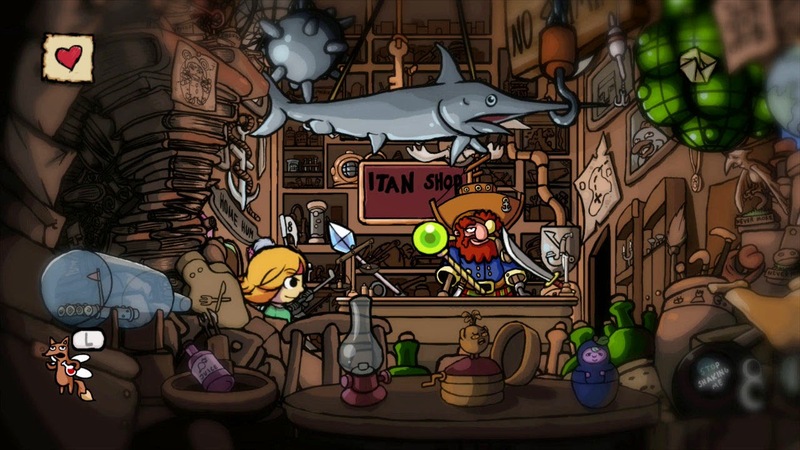 For a game that is essentially a Zelda-lite from an indie developer, Ittle Dew is not a title you will have to settle with by simply saying, "Eh, it'll do." ...I'll excuse myself now, as even I felt how forced that wordplay was.